A proposal to eliminate Idaho’s Grocery Credit Refund and create a sales tax exemption for all grocery purchases would reduce state revenues by roughly $34 million each year while primarily benefiting higher-income taxpayers, tourists and other non-residents. Low-income families would save very little, and some could actually see a tax increase. If grocery tax relief is a priority for Idaho lawmakers, they could increase the Grocery Credit Refund and tie its value to inflation in the cost of food. This would provide more consistent relief to Idahoans up and down the income ladder and would not give a tax cut to non-residents. Alternatively, if the cost of the refund is a major concern, it could be expanded only for low-income households. This could be accomplished by, for example, reviving a recently expired feature in the credit that made households with taxable income below a certain level eligible for a larger credit. This report shows that a reform combining these two approaches could provide larger tax cuts for most income groups at the same cost to the state as eliminating the Grocery Credit Refund and repealing the sales tax on groceries. Sales taxes are one of the most important sources of revenue collected in Idaho and in states across the country. But sales taxes are also highly regressive, meaning they take a larger share of income from low-income families than from the wealthy. ITEP estimates that in 2015, low-income Idahoans will spend 5.9 percent of their income on sales taxes and other consumption taxes, while middle-income families will spend 4.4 percent and the state’s most affluent families will spend just 0.8 percent. This imbalance comes about because lower- and middle-income families must spend a larger share of their income to get by, and thus see more of what they earn subject to sales tax. This is particularly true for sales taxes on necessities like groceries. The most common way states make sales taxes less regressive is to simply exempt groceries from the tax. Since groceries are a major component of overall sales, however, exempting them inevitably creates a large hole in the sales tax base—that is, the range of goods and services subject to the tax. The result is a significant reduction in the amount of sales tax revenue collected and a potential increase in the volatility of sales tax collections as the tax base becomes more reliant on discretionary, nonessential purchases that can decline rapidly during economic downturns. Consider an Idaho family of four living on $25,000 per year and spending 20% of their income on groceries. That family’s grocery bill is $5,000 per year and the 6 percent sales tax on groceries costs them $300 annually. For this family near the poverty line, the Grocery Credit Refund is a $400 annual tax cut—enough to offset the sales tax on food with $100 left over to apply toward their sizeable grocery bill. For a high-income family of four, however, the sales tax exemption is likely to be the better deal. This is because their spending on groceries tends to be higher, and thus the same $400 tax credit will offset some—not all—of their grocery tax bill. groceries costs them $300 annually. to apply toward their sizeable grocery bill. sales tax exemption is likely to be the better deal. will offset some—not all—of their grocery tax bill. 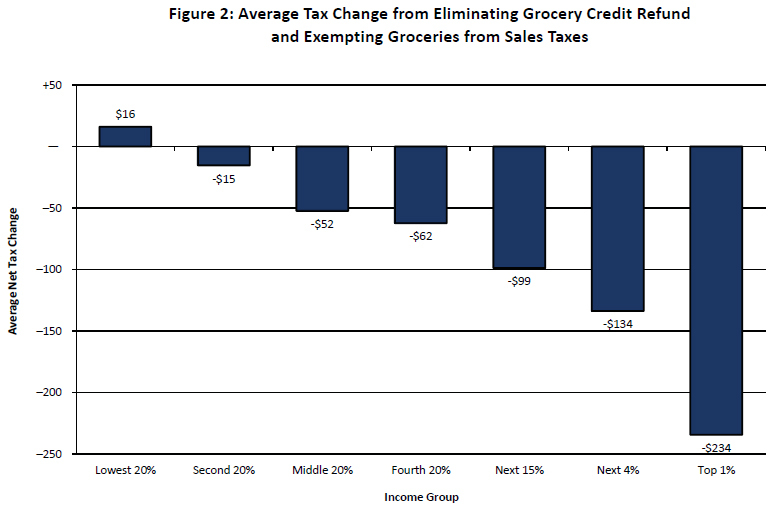 The benefits of grocery tax exemptions are also not very targeted. Visitors from outside the state benefit from grocery exemptions in the same way as residents, and high-income households with large grocery bills tend to receive a disproportionate share of the overall tax benefits. 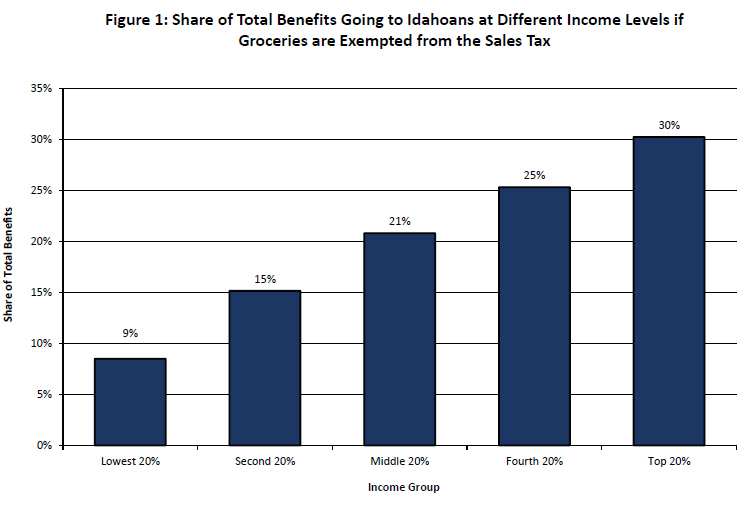 Figure 1 shows that 30 percent of the tax benefits from exempting groceries in Idaho would flow to the top 20 percent of households (those earning $350,000 or more), and that over half (55 percent) of the benefits would flow to the top 40 percent (those earning $84,000 or more). The poorest 20 percent of Idahoans (who earn $19,000 or less) would see just 9 percent of the benefits. Idaho’s current approach to making the sales tax on groceries less regressive is better targeted than a blanket sales tax exemption. Currently, Idaho residents pay the normal 6 percent sales tax on the groceries they buy, but can claim a Grocery Credit Refund of at least $100 per year for each member of their household. (Residents over age 65 receive a refund of $120 per person). In effect, the refund cancels out any sales taxes paid on the first $1,667 spent on groceries per person, per year. But some lawmakers and advocates have recently proposed eliminating the Grocery Credit Refund and creating a more typical sales tax exemption for all grocery purchases. Taken together, these changes would reduce Idaho tax revenues by roughly $34 million each year, while primarily benefiting higher income taxpayers and residents of other states who visit Idaho. 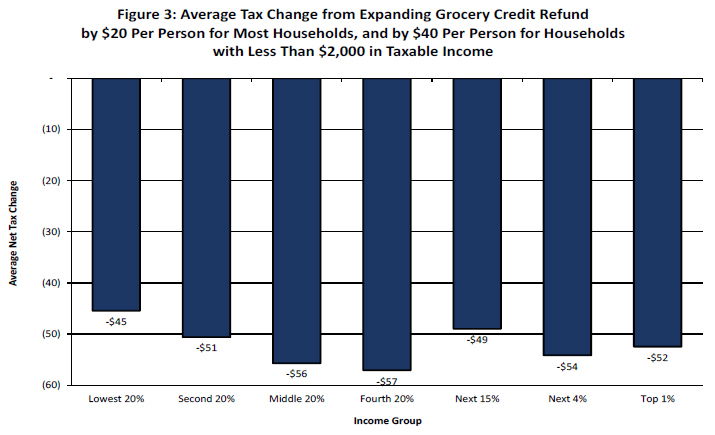 Using the ITEP Microsimulation Tax Model, we find that low-income residents would generally see a net tax reduction of $15 per year or less under this swap, and that some low-income families with very low grocery budgets would actually see a net tax increase. Most of the benefits, by contrast, would flow to high-income households that pay more in grocery taxes as a result of purchasing premium brands and other high-end foods. The top 1 percent of Idaho families—those earning $350,000 or more—would receive an average tax cut of $234 per year. Tourists and other non-residents would also benefit from such a swap since they currently pay tax on grocery purchases but are barred from claiming the Grocery Credit Refund. If grocery tax relief is a priority for lawmakers, they should consider increasing the Grocery Credit Refund and allowing its value to grow each year alongside inflation in the cost of food. Such a change would provide a more equal benefit to Idahoans of all income levels while ensuring that non-residents continue to pay sales taxes on groceries. Another alternative, which would cost less revenue, would be for lawmakers to limit the refund’s expansion to low-income households. One way to do that would be to restore a recently expired feature in the credit’s design whereby households with taxable income below a certain amount were eligible for a larger credit. Figure 3 shows the average tax cuts received by Idahoans at different income levels under a potential reform that combines these two approaches. All Idahoans currently eligible for the credit would see it expanded by $20 per person. And Idahoans with less than $2,000 in taxable income (roughly equal to $12,000 in total income for most single taxpayers and $22,000 for most married couples) would see their credit expanded by $40 per person. This proposal would cost roughly the same as eliminating the refund and exempting groceries from the sales tax ($36 million instead of $34 million), but would provide larger average tax cuts for most income groups. Lower-income taxpayers would see an average reduction in tax of between $45 and $51, compared to tax cuts averaging $15 or less under the alternative. Middle-income taxpayers would fare roughly the same, or slightly better in some cases, with tax cuts of $56 on average. And high-income taxpayers, while still seeing a tax cut, would see that cut reduced from $234 to $54, on average. Idaho’s Grocery Credit Refund is an effective tool for off setting some of the regressivity of sales taxes on groceries. If grocery tax relief is a priority for Idaho lawmakers, they should consider expanding that refund rather than eliminating it in favor of a less targeted grocery tax exemption.